More than perhaps any other iconic guitar, Fender’s Telecaster has two very distinct pickups with different sounds. When you think about it, Leo Fender didn’t really have a sonic reference point for solidbody electric guitars when he was designing the guitar that became known as the Telecaster. All the electrified Gibsons, Epiphones, Gretsches and so forth were essentially hollow-bodied jazz instruments that produced big, mellow and woody tones. Only Paul Bigsby’s guitars were true solidbodies. Leo’s personal musical tastes veered towards western swing and country, so his ears would have been naturally attuned to those big old archtops and the tones of pedal steel guitars. When you consider the stock sounds of a vintage-style Telecaster, that’s sort of what you get – both sounds in one guitar. The pedal steel-like bridge pickup combines with the dark warmth of the neck pickup, and Fender’s early wiring scheme accentuated the contrast. This was achieved by having two very different pickups installed in a single instrument. Compare the Tele with almost every other classic electric guitar and it’s probably unique in that regard. Although most of us have a fairly clear idea of what Teles sound like, the construction of the pickups has changed quite a lot over the years. In this and the next issue, we’ll be taking a close look at vintage-style Tele pickups, and we’ll start with the bridge. For the sake of simplicity, I’m going to use the word ‘Tele’ as a catchall term for the Broadcaster, Esquire, Nocaster and Telecaster, unless otherwise stated. Tele bridge pickups are substantially larger than Tele neck pickups – and the Strat pickups that followed. The wire coils are both wider and deeper, and there’s the curious issue of the metal base plate. 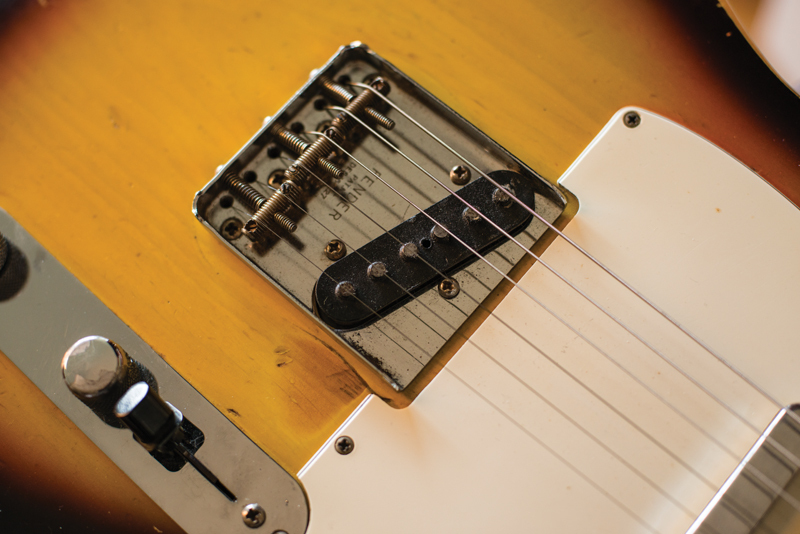 Unlike the neck pickup, which was designed specifically for the Tele, the earliest bridge pickups were adapted from a pickup Fender was already manufacturing for lap steels. In fact, many old Fender Champion lap steels had their original pickups scavenged after Keith Richards’ tech revealed that he had been installing them in his boss’s guitars. Until recently, these easy-to-find pickups were an affordable way into vintage Tele tone. Depending on the magnet wire, they ohm out between 5.8K and 8K. The lower DC reading equates to a clear, harmonically rich and trebly tone, while the hotter ones sound more like Broadcaster pickups. The rectangular bottom flats have to be trimmed to fit and a metal baseplate must be attached, but otherwise the specs are almost identical to the bridge pickups on many of the earliest Esquires and Broadcasters. These included 43-gauge wire and alnico III slugs that were level with the top of the flatwork. However, the diameter of the guitar pickup slugs was slightly wider. The metal baseplate made it easy to hang the pickup off a conventional Tele bridge using exposed screw heads for easy height adjustment. The black leadout wire was also soldered to the base plate, which grounded the bridge and obviated the need for a separate bridge ground wire. The original baseplates were made from steel plated in zinc or copper. These days, you can get plates made from other metals, such as brass and stainless steel, but they have differing effects. Bill Lawrence identified three areas of influence: ferromagnetic functions, electrodynamic functions and shielding. Since the shielding effect is fairly inconsequential, we’ll focus on the others. The ferromagnetic function stabilised and increased the magnetic force of the relatively weak alnico III slugs that were available to Fender at the time. Often called an induction plate, the Tele’s metal baseplate also increased the inductance of the coils – much like adding extra windings. The only metal that does this is steel, and increased inductance and magnetic strength combine to make a pickup more powerful. Steel, copper and brass baseplates all cause eddy current interference. This electrodynamic effect alters the frequency response of a pickup, beefing up the bass and low midrange response to balance out the trebly tone. So copper or brass plates can be used to warm up a Tele bridge pickup without increasing output. If you use steel, you get fatter tone and increased output. Baseplate swapping is a cheap and effective tone tweak, but plates thicker than 1/16 inches can make a pickup sound muddy. Many of the very early lap steel and Broadcaster pickups had plain enamel magnet wire, but this soon changed to heavy formvar. After about a year of production, the magnet wire gauge was changed from 43 AWG to the thicker 42 AWG. The changeover occurred at roughly the same time as Fender adopted the name ‘Telecaster’. This is significant because the thinner wire had allowed Fender to get more turns on the bobbin, so the DC resistance of the earlier Esquire and Broadcaster bridge pickups can be around 10K. Typically, this drops to about 7.8K with the thicker wire. Also consider that thinner wire has higher resistance for an equivalent number of turns, and the coils have lower inductance. The earlier pickups with the thinner wire sound beefier than twangier, brighter Tele pickups – like a Tele with a hint of P-90. This ties in with the observations of Matt Gleeson from Monty’s pickups. He points out that coils of 42 AWG and 43 AWG wound to 10K will sound different. The 42 AWG coil will have higher output, while the 43 AWG coil will have more midrange and compression. The next change occurred around 1954, when Fender started using stronger alnico V slugs rather than alnico III. Initially, they were flush with the top but by 1955 they protruded and were staggered like the slugs on the new Stratocaster pickups. 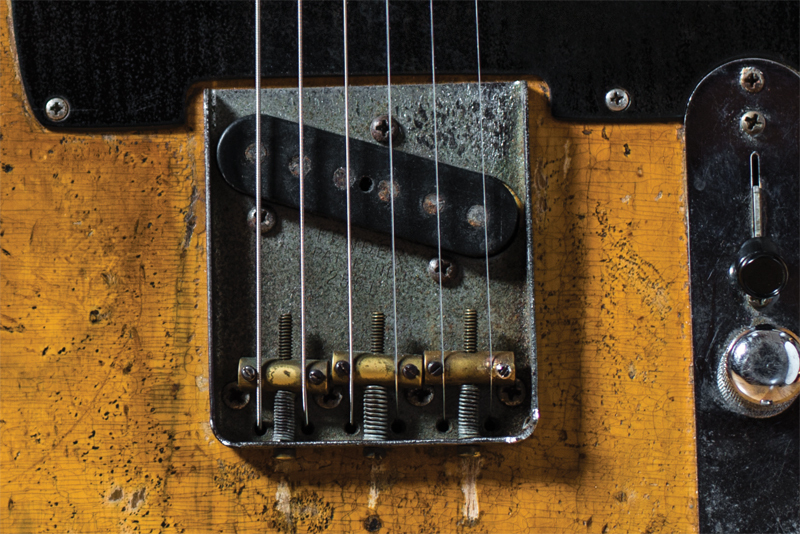 This was the bright, cutting, twangy pickup that became synonymous with country picking. With modern strings, they can sound edgy, but when they were introduced most players used warm-sounding nickel strings with round cores and a wound G. If you want to tame your Tele’s treble, you could use the same, but the wound G is optional. Nothing much changed until around 1964, when Fender stopped using black flats on the bottom of the pickup and changed to grey. Around the same time, the company swapped from formvar to plain enamel magnet wire. By the late 60s, Fender was dipping the pickups in lacquer to solidify the coils rather than wax potting. Since lacquer sets much harder than wax, this can result in coils that are very solid on the outside but loose inside. Pickups from this era can sound very lively and sensitive, but they can be prone to squealing. By the late 70s, players were using higher gain and volume levels, which caused serious problems with excessively microphonic pickups. You can sometimes cure microphony issues by ensuring the plate is fixed firmly to the pickup’s base and by using surgical tubing spacers rather than metal springs with the height adjustment screws. Instead, Fender chose to stop using baseplates altogether on some models – and those guitars sound less Tele-like as a result. 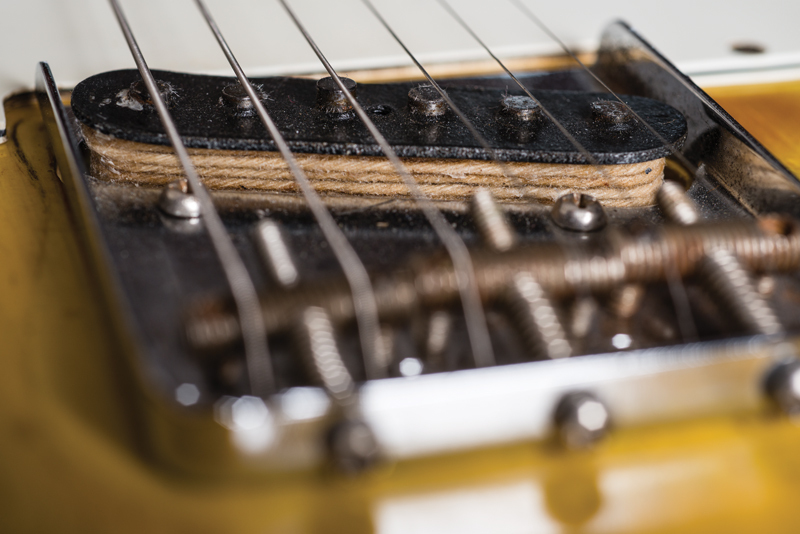 Check out our recommended Telecaster bridge pickups here.